"While Webster, situated four miles to the South, is the county seat of Jackson County, Sylva, by reason of the facilities afforded it by the Southern Railway, is in many respects a far more important town. From the post office here, the residents at the county seat are served with mail twelve times each week. Continuing to the Southward from Webster, the postal route from Sylva serves all the country between the county seat and Cashier's Valley, in the Southern part of Jackson County. Cashier's is really not a valley but a magnificent undulating plateau, with an altitude of 3,478 feet. A second postal route runs from Sylva across the mountains through Tuckasegee, Wolf Mountain, and Balsam Grove, to Cherryfield in Transylvania County, in the region of the exquisite Sapphire Country, in the very heart of the 'Land of the Sky.' "
"The country surrounding Sylva is noted for its kaolin deposits. The plateau section about Sylva is rich in agricultural resources and fertile to a remarkable degree. Several extensive apple orchards are located near the town, and many small fruits, including grapes, are grown in the vicinity. Extensive and improved stock-raising is engaged in successfully. The general business of the little city is increasing rapidly. Visitors find excellent accommodations in a first-rate hotel and in several private boarding houses. The scenery in the vicinity of the town is charming. The nearby mountains are clothed with dense forest almost to their very summits. Fine views may be obtained here of the Plott Balsams, to the North, while to the South the Richland Balsams, with their many rugged spurs, rise in majestic grandeur." "The Southern Railway carpenters arrived in Sylva Wednesday and begun the work of erecting Sylva’s new depot. The work will be pushed forward as rapidly as possible and will be completed by the last of March. For some time the Southern has been promising to build a new freight and passenger depot here, as it has been badly needed, but for diverse reasons they did not get around to it as soon as had been hoped. The old part of the depot will be remodeled and fitted with a roof of fire proof material and will, with some extension at the east end, serve as a freight depot, while new offices and waiting rooms will be built at the west end of the present structure. This will give Sylva one of the best and most convenient depots on the Murphy Division." 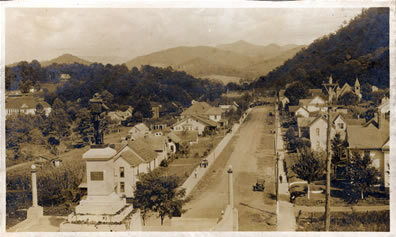 In 1913 Jackson County voters approved relocating the county seat from Webster to Sylva. Work soon began on a new courthouse based upon the courthouse that had been built in Madison County only a few years earlier. 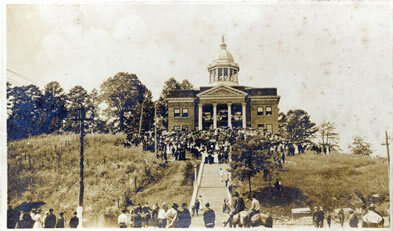 By early 1914 the new Jackson County Courthouse was completed on a hill overlooking the town, offices were occupied in February and on March 2, 1914, Sylva was pronounced the new county seat. 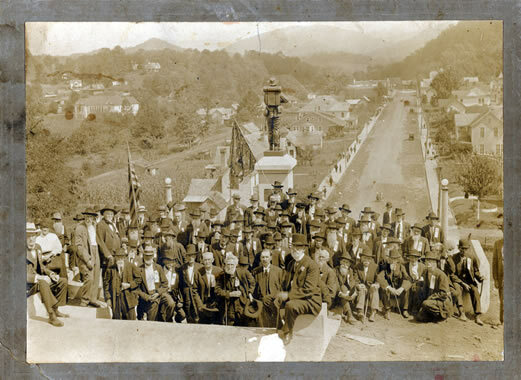 This photograph was taken during the September 18, 1915, dedication of the Civil War monument on the steps leading from Sylva’s Main Street to the Courthouse. "The whole order of the day was surcharged with interest and thrill from beginning to end. Early in the forenoon the crowds began to gather and the streets of the little `gem of the mountains’ were alive and astir. Every train brought crowded coaches, and long processions of wagons, buggies, carriages and automobiles, flanked and re-inforced by riders on horseback, could be seen converging upon the capital city of the county." ". . . . the citizenship of Jackson County and of Sylva received new inspiration to look forward to the brighter and better days yet to dawn." C.J. Harris’ extensive business interests in Jackson County, N.C., included a retail store, banks, electric power company, clay mining operations, and a tannery. 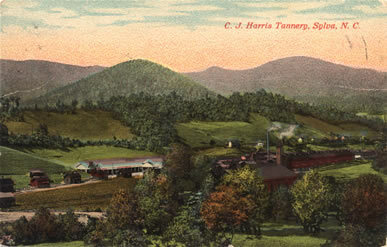 This view of the Harris Tannery was postmarked 1922. In its issue of December 24, 1915, the Jackson County Journal (Sylva, N.C.) ran an article headlined “Armour Leather Co. Buys Interest in Tannery,” and noted that C.J. Harris had made “one of the largest business deals in this county in some time” by selling a share in the Harris Tannery to Armour Leather Company.